Title : 'Illust Labo special #5' Technique for Manga illustration art book Language : Japanese. This is an official book. Release Date : 01/1996 Total Pages : 130 pages Condition : USED, Very Good, No missing page. This is a Japanese Manga (Anime) Artist Magazine Book. The article on a famous Manga artist has been described in this book. If you like to draw MANGA of Japan, this book will become a wonderful book for you. Even if you can not read Japanese, you will be able surely to enjoy it! 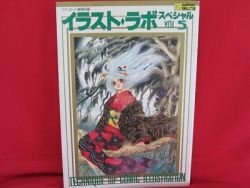 !#Feature of this book : 86 Manga artist's illustration.